AGP leader Mukunda Ram Choudhury and ex-Congress leader Hiranya Bora join the Congress party in a programme in Guwahati on Saturday. 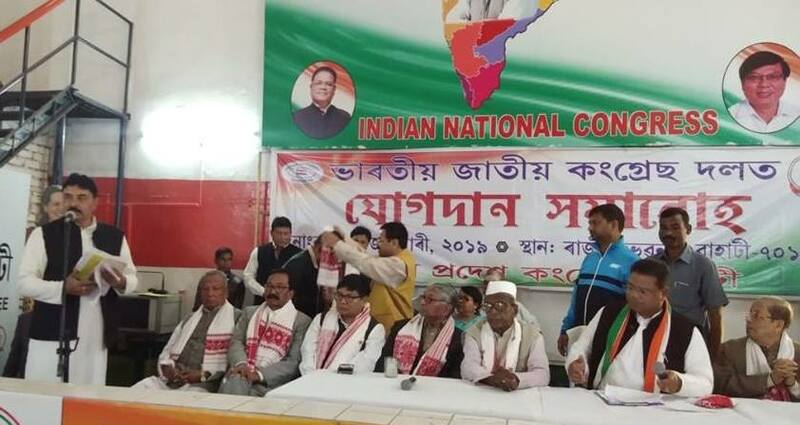 Two former MLAs—AGP leader Mukunda Ram Choudhury and ex-Congress leader Hiranya Bora—on Saturday joined the Congress party here, giving a boost to the opposition party in the state just two months ahead of the Lok Sabha polls. Both of them joined the Congress party in a programme at Rajib Bhawan here in the presence of APCC president Ripun Bora. “Both of them have joined the party unconditionally and will work to uproot the BJP government in Assam,” said state Congress president Ripun Bora. It was a homecoming for former veteran Congress leader and ex-MLA Bora, a vocal detractor of then APCC president Anjan Dutta. Bora had resigned from the party in 2015 after the APCC issued a show cause notice to him for publicly criticizing the then party president late Dutta. Former Dhekiajuli MLA Borah unsuccessfully contested the Assembly polls in 2016 from Sootia LAC. AGP leader Choudhury represented Kalaigaon constituency in the Assam Legislative Assembly from 2011 to 2016.